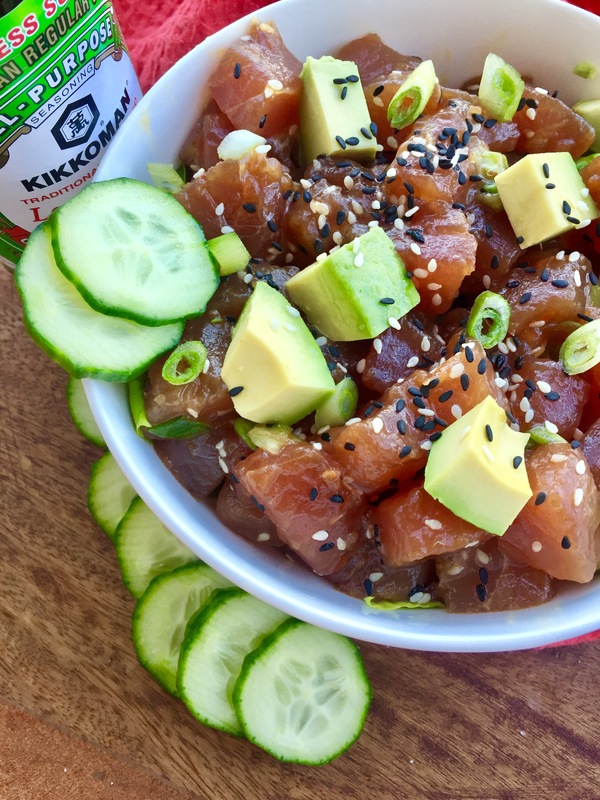 I partnered with Kikkoman and had the opportunity to create this delicious sodium saving recipe! 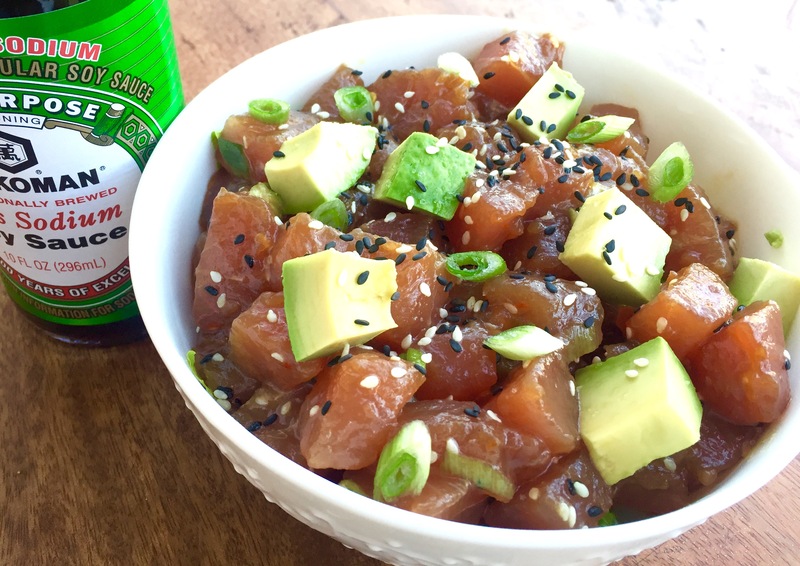 It is bursting with flavor by using Kikkoman’s Less Sodium Soy Sauce , it is also simple to make! I love poke and it’s not too often that you can find a good poke. 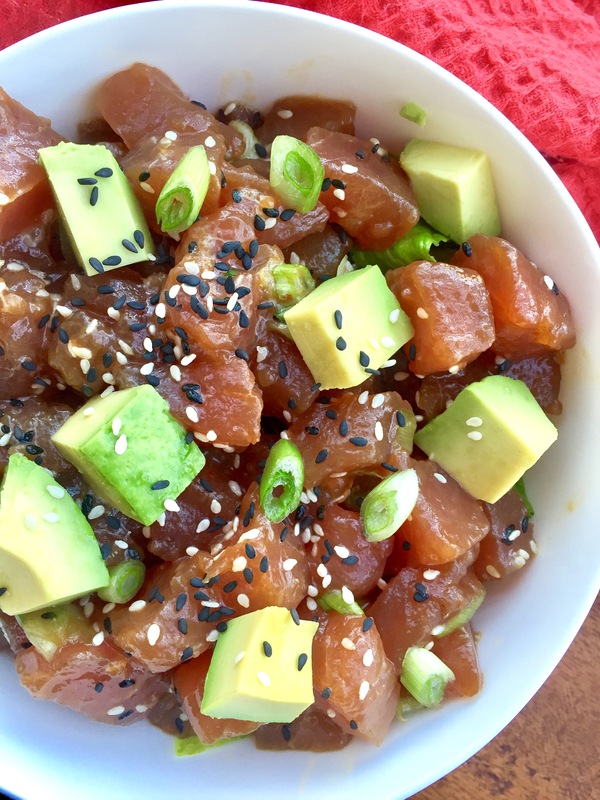 I have always wanted to make my own poke but it always seemed so intimidating to make and prepare because it is made with raw fish. Luckily I live in Monterey so finding fresh fish around here is easier than most places. I got my fresh sashimi/sushi-grade tuna from Monterey Fish Company here in town. You should be able to find fresh sashimi/sushi-grade tuna at a specialties grocery store or your local grocery store that has a relatively large seafood department. 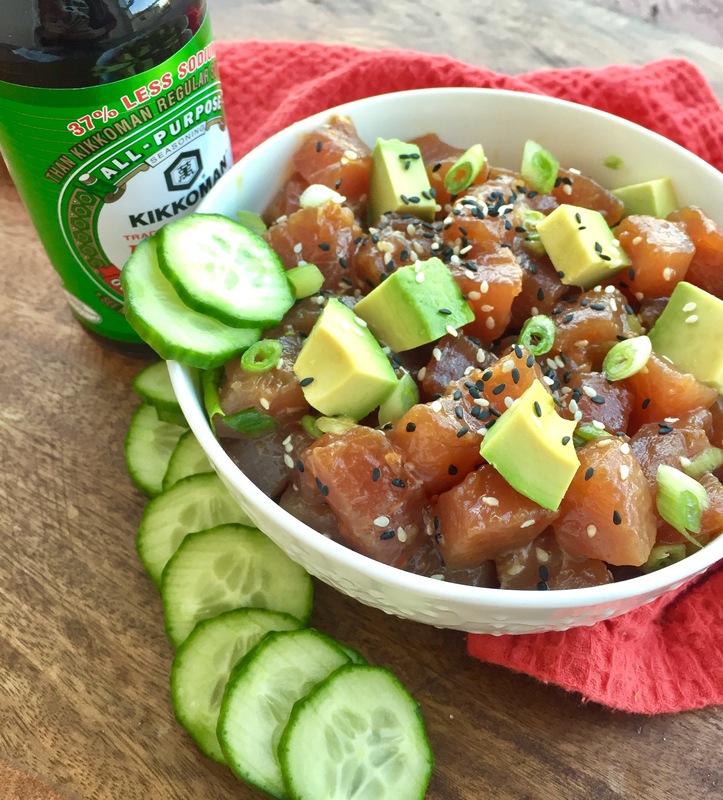 This recipe makes me extra happy because by using Kikkoman’s Less Sodium Soy Sauce, I am significantly cutting down the sodium intake that it usually found in poke. In a medium mixing bowl, whisk together the Less Sodium Kikkoman Soy Sauce, Kikkoman rice wine vinegar, sesame oil, sesame seeds and red pepper flakes until combined. Add the cubed tuna and scallions and mix with a spoon. Mix gently as the fish is delicate. Mix until tuna cubes are covered in the dressing. Cover with plastic wrap and let marinade in refrigerator for at least 20 minutes. This will allow all the flavors to enhance, do not skip this step. Once marinated, scoop poke into bowls and top with more sesame seeds and scallions. Serve over brown or white rice, chopped romaine lettuce, seaweed salad, or simply eat it as is! Pinning! Easy recipe. Pretty pics. Just what I want to eat.